After a short eight-minutes trip from Toride to Abiko, the new city we are staying at, we were welcomed by the lovely LOC (Local Organizing Committe)-members of this town. They made us familiar with our new surroundings by showing us where Abiko is situated and giving us some general information about the city, while they were at the same time explaining about its cultural aspects. In addition we met one of the mascots of Abiko city. I was so lucky and genki when they told me that I could wear his costume afterwards! It was so much fun and sort of awkward running around with the costume on, getting some pictures with friends while you are sweating like crazy since it gets so hot in that outfit. Afterwards we had lunch with the local people, which turned out to be really fun since they were really open-minded and not shy at all. They would walk up and talk to us, so we had some nice little conversations going on. 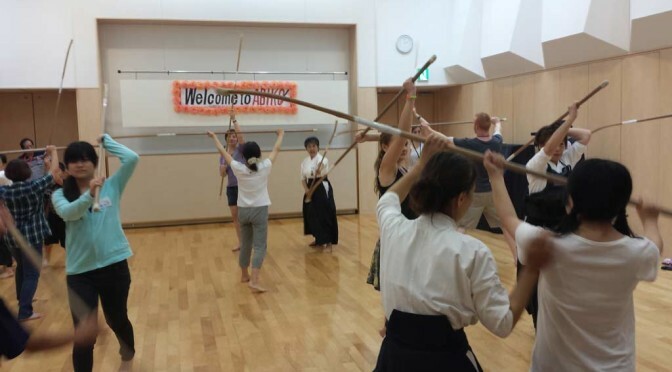 After a short ice-cream and ‘puru-puru’ (pudding) break (^.^ i love puru-puru), we got to experience one of the many Japanese martial arts, called Naginata. Not only would they perform for us, but we even got to learn some pretty cool moves and hitting techniques with our wooden spear-sticks (is that even a word?). They even brought along some presents for us which was really nice of them.